Number of Tweets in the period of the carnival in London. Credit: Suma et al. With a growing number of devices connected to the internet and countless people sharing their live experiences online, a huge amount of useful data is being generated every minute. The analysis of this data could improve the dissemination and understanding of information about traffic, events, and other city-related experiences. Big Data Analytics will most likely play a key role in the cities of tomorrow, enabling systems that sense a city at micro-levels and inform both governments' and citizens' decisions within limited time frames. Researchers at King Abdulaziz University, in Saudi Arabia, have recently used Big Data Analytics to detect spatio-temporal events around London, testing the potential of these tools in harnessing valuable live information. "My research was an application towards smart society as a subpart of smart city," Sugimiyanto Suma, one of the researchers who carried out the study, told Tech Xplore. "It was a workflow design using Apache Spark and Tableau to detect spatio-temporal events in the city, for city awareness, decision making, and city planning. It was based on social media analytics by collecting, processing and analyzing large data from Twitter, which succeeded in detecting events in London with their location dissemination, event name and time." The study was aimed at efficiently detecting events around London by analyzing data collected on social media platforms, while also developing architecture of big data analytics that could be useful for spatio-temporal event detection. To do this, the researchers used big data and machine learning platforms Spark and Tableau to analyze over three million Tweets relevant to London. 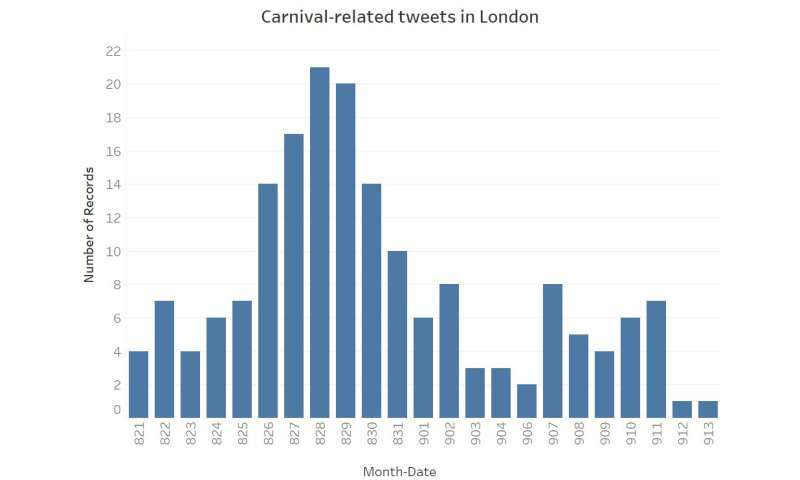 Tweet intensity related to carnival in London. Credit: Suma et al. This was the first study that effectively used Apache Spark, an open-source cluster-computing framework, for social media-based event detection. In addition, they used the Google Maps Geocoding application programming interface (API) to locate Tweeters around London and carry out further analyses. "We found and located congestion around London and empirically demonstrated that events can be detected automatically by analyzing data," Suma said. "We detected the occurrence of multiple events, both their locations and times, including the London Notting Hill Carnival 2017 event, of which we had no prior knowledge." In future, the big data analytics workflow for spatio-temporal event detection developed by Suma and his colleagues could be adopted and perfected by other researchers to achieve more detailed results about events. It could also assist the government and other stakeholders in their decision-making and city planning processes. The researchers are now exploring ways to further improve their system, in order to achieve greater detection accuracy, wider spatio-temporal detection, and a higher quality of analyses. "For the detection accuracy, we plan to develop algorithms and compare the result with actual information by associating it with events reporting such as news or media websites," Suma explained. "For wider detection, we would acquire more social media data such as Facebook. Finally, for better quality of analysis, we hope to utilize more AI techniques." The study was published in the Smart Societies, Infrastructure, Technologies and Applications. Big data technologies enable smart city systems in sensing the city at micro-levels, making intelligent decisions, and taking appropriate actions, all within stringent time bounds. Social media have revolutionized our societies and is gradually becoming a key pulse of smart societies by sensing the information about the people and their spatio-temporal experiences around the living spaces. In this paper, we use Twitter for the detection of spatio-temporal events in London. Specifically, we use big data and machine learning platforms including Spark, and Tableau, to study twitter data about London. Moreover, we use the Google Maps Geocoding API to locate the tweeters and make additional analysis. We find and locate congestion around London and empirically demonstrate that events can be detected automatically by analyzing data. We detect the occurrence of multiple events including the London Notting Hill Carnival 2017 event, both their locations and times, without any prior knowledge of the event. The results presented in the paper have been obtained by analyzing over three million tweets.